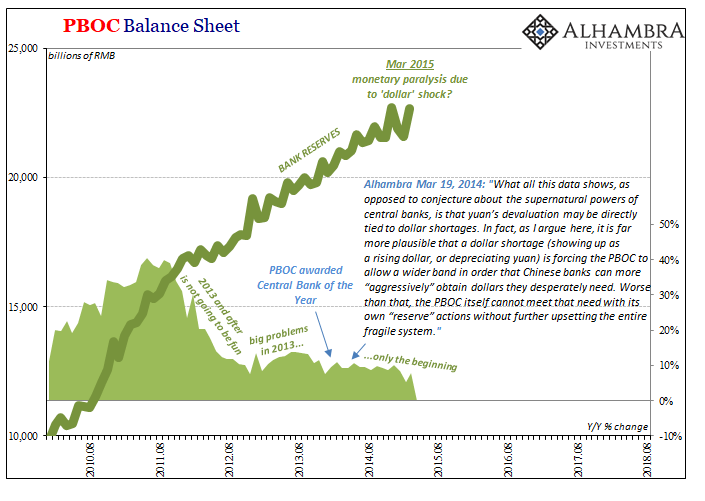 File it under “what were they thinking?” In March 2015, confronted by a severe external monetary squeeze, the PBOC made a truly radical choice. Maybe it was that for a few months anyway things looked a little better. The eurodollar system had practically melted down globally first on October 15, 2014 (collateral) and then in December 2014 and January 2015 culminating with the breaking of the Swiss National Bank. February and March 2015 were so much better by comparison. 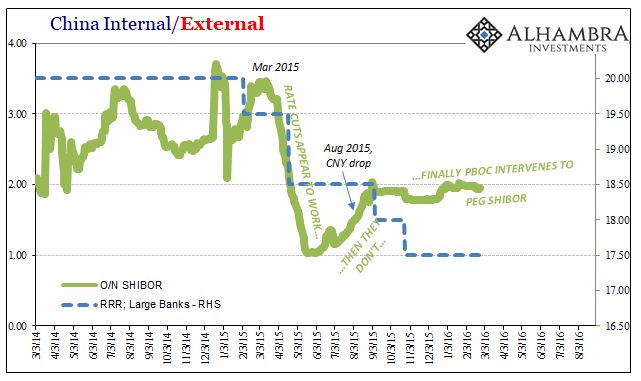 Perhaps thinking that was the beginning of a recovery, at least an end to the squeeze, China’s central bank would decide beginning at that time over the rest of the year it would permit its asset side contraction (eurodollar problem) to visit domestically via its liability side. As I diagrammed earlier today, on the money side the level of bank reserves had to correspond proportionally. They shrunk precipitously. Obviously, Chinese officials underestimated what that would mean. They would have had to have believed their offsetting tool, RRR cuts, were going to be a more than sufficient cushion to what they were attempting. They were wrong. Very wrong. 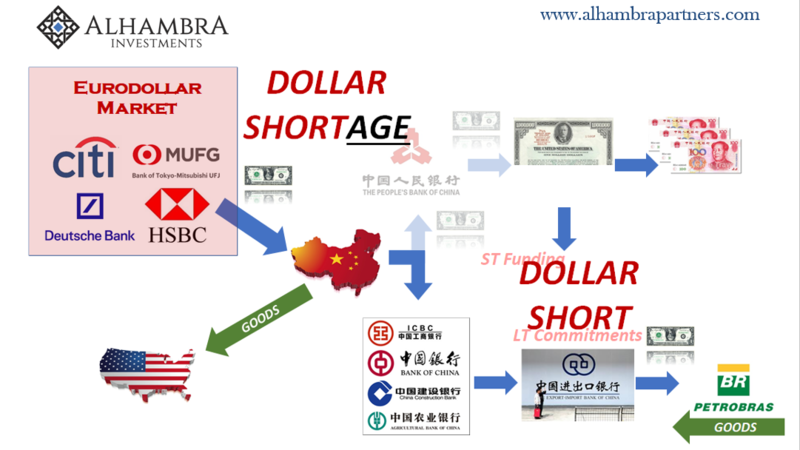 In theory, it is pretty simple and straightforward: less dollars for China means at least slowing growth or in this case contraction on the asset side of the central bank balance sheet; that can mean either increasing RMB assets (bank window lending through the MLF and other new programs) or letting base money decline (which is what they chose); decreasing bank reserves would therefore be offset by allowing banks to use more of those they have already accumulated (RRR cut). Undoubtedly, the central bank did all the proper calculations and ran all the orthodox Monte Carlo simulations such that in March 2015 central bankers were confident enough it would work. Initially, it did. Despite what became a sharp fall in bank reserves, 150 bps between two RRR cuts seemed to have left RMB money markets with a flood of RMB liquidity (pushing SHIBOR, unsecured RMB money rates, decidedly lower).  These were aided by reductions in benchmark money rates, too, the so-called “double shots” of Chinese monetary policy. By late May 2015, however, “something” had changed. 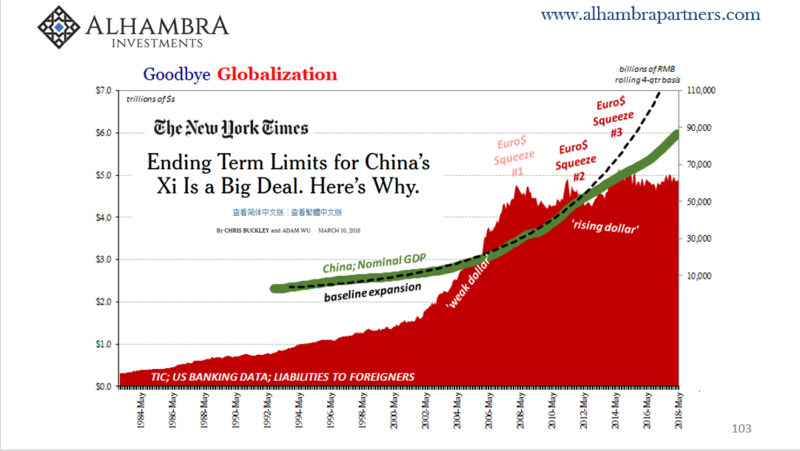 Not just in China but globally as the “unexpected” effects of “transitory” factors had begun to really bite the global economy. Instead of unlocking private reserves, banks began to hoard RMB liquidity despite the lower reserve requirements. They were scared, and the lack of PBOC presence probably didn’t help. It was during this period when everything really got serious, including the global fireworks and liquidations of that August. Attempting to regain control once more with additional changes to reserve requirements, but unlike earlier in 2015 there wasn’t much put up by private banks in liquidity. The PBOC just took over the market at that point. The more things change, the more they stay the same. The cliché is as true today the more everyone says that the global financial system is resilient, and the economy strong. The Chinese wouldn’t just beg to differ, they are practically screaming about it. The PBOC in April told everyone to buckle up. That was the first RRR cut, following as it did a very clear shift in bank reserve policy going back to the beginning of the year. The eurodollar squeeze was back and unlike 2017 the central bank wasn’t going to offset it (for reasons I’ve covered at length). Thus, like 2015, RRR. April’s reduction was followed with another in July, this second one producing initially the desired effect: a flood of RMB liquidity that pushed unsecured and repo rates substantially lower. But only temporarily. They came back up almost as quickly as they declined. 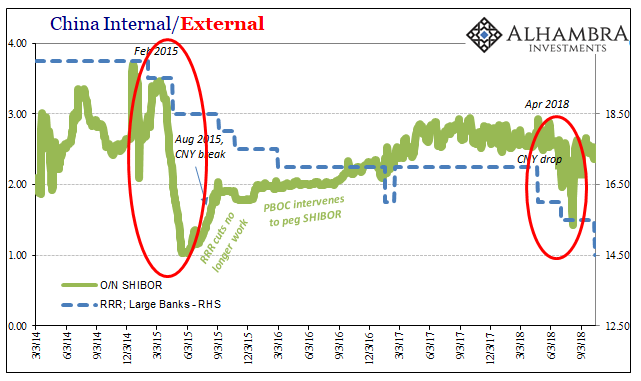 With the central bank supporting, in all likelihood, confirmed to a limited extent by TIC, CNY over the past few months that would only mean more hardship on the PBOC’s asset side. Therefore, more declines on the money side, this time in both bank reserves as well as physical currency. As to the former, a third RRR cut was announced just over a week ago. Like April, it was an additional 100 bps. This isn’t a one-to-one situation, it almost never is in money and central banking, and so there may be time lags to consider along with structural frictions including those tied to the lingering aftermath of this last Golden Week. Still, this isn’t an encouraging first step for the third RRR adjustment. You have to believe that at some point, like in the middle of 2015, banks see the same thing the PBOC does. In other words, the Chinese banking system that year didn’t just operate blindly; banks knew very well that things were going from bad to worse and that the PBOC was, to a great extent, pinning its hopes for stability on them. It’s not really a burden any financial institution wants even under ideal circumstances. Under less than ideal circumstances? Forget it. I hope you can see and appreciate the similarities. Even if you believe the US economy is booming it is now almost universally recognized as alone in that state (and it’s not really, which the Chinese know better than anyone else). The global economy is at least slowing and at great risk of rolling over. 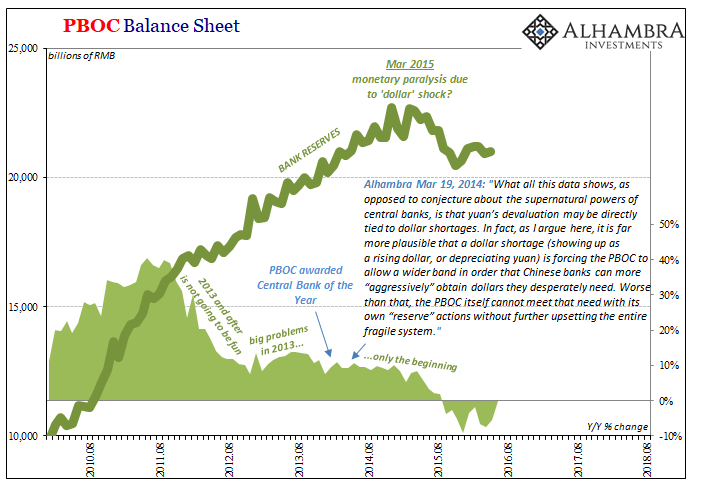 The PBOC is doing the same thing at the same point in the cycle as last time. This time it ends well? Maybe, but if you are a Chinese bank are you the one sticking around to find out? 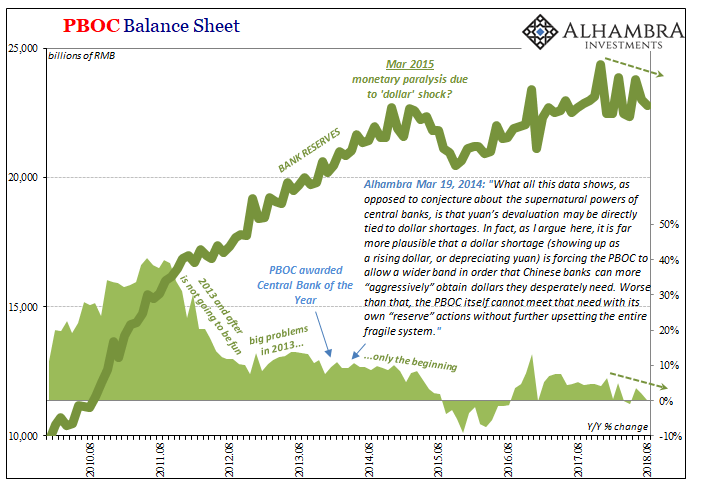 With the PBOC basically telling everyone it forecasts no change for its eurodollar problem going forward, it isn’t difficult to understanding the cautious (some would say prudent) instinct toward greater liquidity preferences. As risks skew further and further negative, it wouldn’t be a surprise that at some point Chinese banks go back to hoarding RMB liquidity again and no matter how many or how large the next RRR cuts might be it won’t produce the desired effect. China may have already arrived at that moment, perhaps not yet. It seems like the apocryphal definition of insanity fits right here, though.